At number 2 in The Guardian’s list of the ten best physicists is Niels Bohr. Bohr is best known for his work on the allowed orbits an electron in an atom can have. This is the so-called “Bohr model”, and in 1922 he won the Nobel Prize in Physics for this suggestion that electrons can only exist in certain allowed orbits, which naturally explained the line spectra of the elements. Niels Bohr was born in Copenhagen in 1885, the second of three children. His father, Christian Bohr, was a professor of physiology at the University of Copenhagen. His mother, Ellen Adler, came from a wealthy Danish Jewish family. At 18, Bohr enrolled at Copenhagen University where he studied physics. In 1905, whilst still an undergraduate, Bohr won the first prize in a competition sponsored by the Royal Danish Academy of Arts and Sciences. In May 1911 he obtained his PhD for a thesis on the electron theory of metals. In the same year, Bohr took up a post-doctoral research position at The University of Manchester, working in Ernest Rutherford’s research team. He arrived in Manchester just as Rutherford was proposing the theory that atoms contained small, positively charged nuclei; where nearly all the atom’s mass was concentrated. However, by 1912 Bohr had returned to his native Denmark where he got a job teaching medical students. In 1913 he published his first paper suggesting what is now known as the “Bohr model” of the atom. He returned to Manchester in 1914, and spent two more years working with Rutherford, as a Reader in the Physics Department. Then, in 1916 a Professorship in Theoretical Physics was created for him at the University of Copenhagen. In 1918 Bohr started trying to establish an institute of theoretical physics in Copenhagen, the institute opened in 1921 and became known as the Niels Bohr Institute. Apart from fleeing from Nazi occupied Denmark in 1943, Bohr spent the rest of his career as the Director of this institute he had established, and died in 1962 at the age of 77. When Rutherford proposed his model of the atom with a positively charged nucleus and the electrons in orbit about it, a problem arose. Classical physics predicted that an electron in orbit, because it is constantly accelerating through changing its direction, should be constantly radiating. As a consequence, it should lose its energy and spiral in towards the nucleus. Calculations showed that this should happen in millionths of a second, meaning all atoms would be unstable. In 1913, Bohr suggested that electrons could only exist in certain allowed orbits. He suggested that these orbits were “quantised”, and that the angular momentum of electron orbits had to be equal to where is an integer (1,2,3 etc.) and where is Planck’s constant. Bohr then suggested that electrons could be excited from one orbit to another, either by gaining some (or all) of the energy of an incoming electron, or by absorbing all of the energy of an incoming photon. When electrons were excited to a higher energy level, they would quickly jump back down to the lowest available orbit, and in so doing would emit light (photons) of particular wavelengths. This “Bohr model” was able to naturally explain the observed spectra of hydrogen (which only has one electron and one proton), and of singly-ionised helium, which again only has one electron. 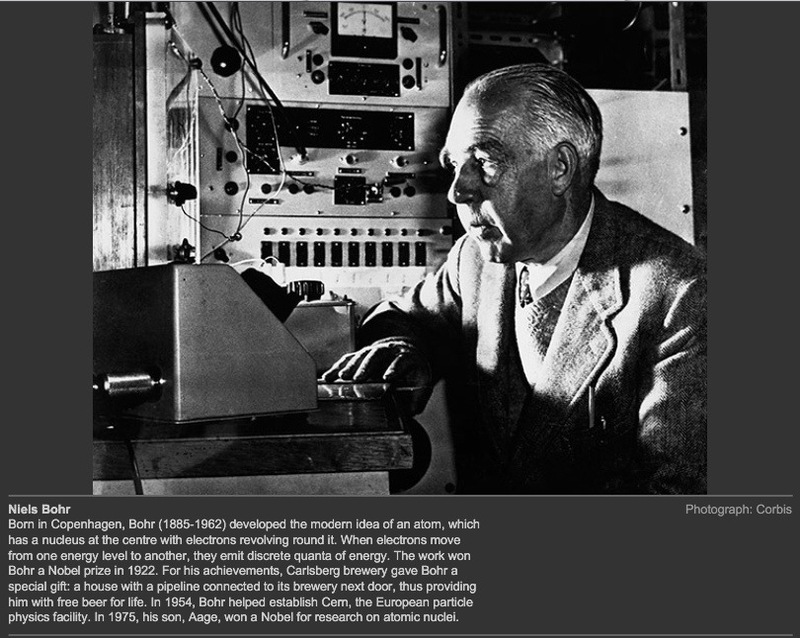 Its success led to Bohr being awarded the Nobel Prize in 1922, the citation reading “for his services in the investigation of the structure of atoms and of the radiation emanating from them”. Bohr played a central role in the probabilistic interpretation of Quantum Mechanics. The so-called “Copenhagen interpretation”, of which he was the main champion, was that physics was not able, under the laws of quantum mechanics, to give us any more than the probabilities of the outcomes of experiments. This was in stark contrast to e.g. Einstein, who believed that that nature was inherently deterministic not probabilistic. Bohr was instrumental in the establishment of CERN, the European Centre for Particle Physics Research. He was very much one of the elder-statesmen of the Physics community, and a period at his Institute in Copenhagen became almost essential in the career of any theoretical physicist. Do you think Niels Bohr deserves to be in this list of the ten best physicists? You can read more about Niels Bohr and the other physicists in this “10 best” list in our book 10 Physicists Who Transformed Our Understanding of the Universe. Click here for more details and to read some reviews. At number 12 in Rolling Stone Magazine’s 500 greatest albums is “Kind of Blue” by Miles Davis. 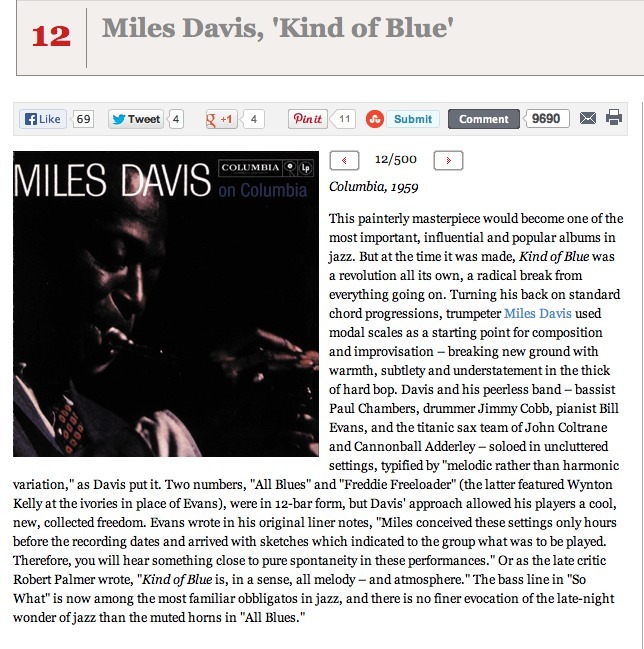 At number 12 in Rolling Stone Magazine’s 500 greatest album is “Kind of Blue” by Miles Davis. Here is the track “Freddie Freeloader”, finding this link was the first time I had heard it. I am not a fan of jazz at all, so have never heard any of this album. Does anyone who is familiar with it think that it deserves to be considered the 12th greatest album ever? I heard about this story a few weeks ago on the radio, and thought I would share a newspaper article about it here. It is the first time in the Disunited Kingdom that a “forced sterilisation” of a person has been allowed by the courts. Because of the man’s learning difficulties, he was not able to give consent to the vasectomy operation himself because he has the mental age of a child. But, he told the court that he wanted this operation, so that he would be able to re-engage in an intimate relationship with his girlfriend, who also has learning difficulties and with whom he already has one child who is cared for by the girlfriend’s mother. I think the story raises some interesting questions. After hearing the story on the radio, I also heard an interview with a person from a mental health charity, who was supporting this unprecedented ruling. What are your thoughts about this? Is it too intrusive for courts to decide such matters for individuals who don’t have the capacity to make such a decision, or was this decision the best thing for the man’s wellbeing? Just time for a quick post today. 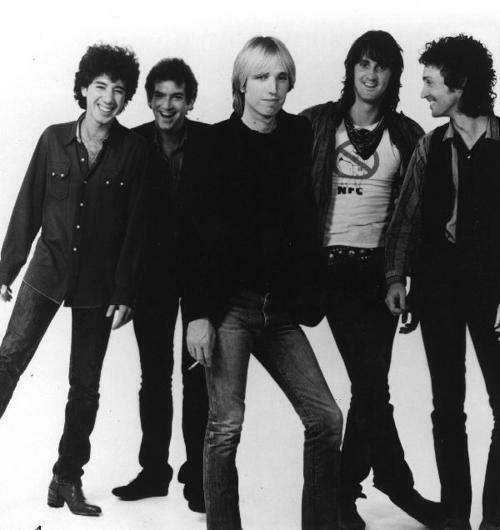 I thought I would share this great song by Tom Petty and the Heartbreakers, “Learning to Fly”. This was a hit in 1991 and is from their album Into the Great Wide Open”. Enjoy! What is your favourite Tom Petty song? 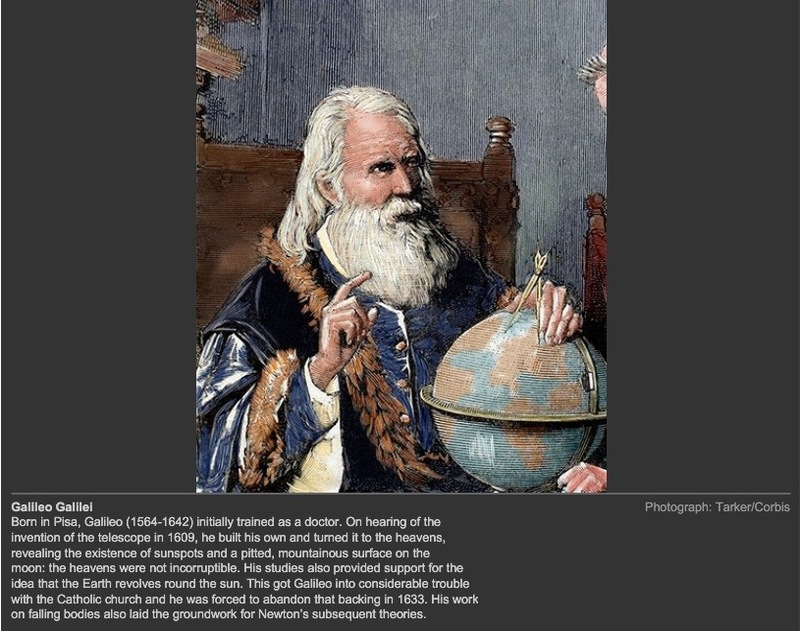 At number 3 in The Guardian’s list of the ten best physicists is Galileo Galilei. Galileo is often thought of as the founder of experimental science, although there were others before him. But there is no doubting his huge contribution in our early understanding of what we now call physics. He made important observations of the Solar System, including discovering four moons orbiting Jupiter, and showing that Venus must be orbiting the Sun. He showed that a pendulum keeps the same period irrespective of amplitude, and that the period depends on the length of the pendulum. He introduced the concept of inertia, the tendency of bodies to remain at rest or to keep moving. Galileo was born in 1564 in Pisa, Italy. He was the first of six children; his father Vincenzo Galilei was a famous musician. Galileo initially studied for a medical degree at the University of Pisa. But, in 1581, whilst doing his medical studies, he noticed that a swinging chandelier’s period was not dependent on how large the swings were but rather on the length of the pendulum. This changed the course of his life, he persuaded his father to let him abandon his medical studies and instead he switched to studying mathematics and “natural philosophy” (as physics was commonly known at the time). In 1589 he was appointed Chair of mathematics at the University of Pisa. In 1592 he moved to the University of Padua, where he taught mathematics, geometry and astronomy. He stayed in this position until 1610. In 1609 Galileo built a telescope and was soon making important discoveries, including proof that Venus orbited the Sun. He published this and other findings, bringing him into conflict with the Catholic Church. In 1616 Galileo was summoned to Rome and told to stop promoting the idea of a Heliocentric Universe, the idea that the Sun and not the Earth was at the centre of everything. Initially Galileo obeyed, but by 1623 he revived his project of working on a book to argue in favour of the Heliocentric model. This was finally published in 1632, under the title “Dialogue Concerning the Two Chief World Systems”. This book some him placed under house arrest by the Church, under which he lived for the rest of his life. In In 1638 he published “The Two Sciences”, which summarised much of his life’s work. It is for the work in this book that Galileo is often referred to as the “father of Physics”. He died in 1642, and is buried in the Sante Croce in Florence. Galileo’s title as “the father of Physics” comes about because of his laying the foundations of much of mechanics, which Isaac Newton later formalised in a more mathematical framework. Whilst he was still training for a Medical degree, he noticed in 1581, that the period of oscillation of a chandelier did not depend on how large the swings were, but only on the length of the pendulum. The story is that this observation was made in Pisa Cathedral, where a chandelier was being blown by the wind to swing with different amplitudes. Galileo used his pulse to measure the periods and saw that they were all the same, irrespective of the amplitude of the swing. After building his own telescope in 1609, based on the design of one built in The Netherlands about which he heard, Galileo made some crucial observations which helped show that the Earth and the other planets orbit the Sun, contrary to the popular view of the time. Key to showing the veracity of the Heliocentric model were Galileo’s discovery of four moons orbiting Jupiter, and his observations of Venus. Once Galileo had showed that Jupiter had moons orbiting it, it strengthened the argument that not everything went around the Earth. However, Jupiter’s moons still allowed for the planets, the Moon and the Sun to be orbiting the Earth (the Geocentric model), but with Jupiter having its family of moons. However, when Galileo turned his telescope on Venus he was able to see that the planet exhibited all phases, from crescent to full, just like our Moon. Not only this, but the size of Venus when full was smaller than when it was crescent. It is impossible to explain these observations if both the Sun and Venus are orbiting the Earth. If one has a model where Venus is orbiting the Sun and both orbit the Earth it is possible to explain the observations, but the size difference between the crescent and full phases of Venus argues against this interpretation. In a model where Venus orbits the Sun inside of Earth’s orbit about the Sun the observations are explained perfectly in the most simple fashion. Galileo argued against Aristotle’s view that heavier objects fell more rapidly towards the ground. It is not clear whether he actually conducted the experiment, but he argued that two objects of different weights would fall at the same rate. He introduced the concept of inertia, which is the tendency a body has to either stay at rest or keep moving once it is set in motion. Galileo’s Principle of Inertia stated: “A body moving on a level surface will continue in the same direction at constant speed unless disturbed”. Newton’s first law of motion is essentially a statement of the concept of inertia. Galileo also made many other contributions to Physics including attempts to measure the speed of light using lanterns, and developing thermometers and better compasses. He was one of the first scientists to realise that much of physics can be explained mathematically. Personally I think there is little doubt that this pioneer of experimental physics deserves to be in this list of the ten best physicists. What do you think? You can read more about Galileo and the other physicists in this “10 best” list in our book 10 Physicists Who Transformed Our Understanding of the Universe. Click here for more details and to read some reviews. At number 13 in Rolling Stone Magazine’s 500 greatest albums is “The Velvet Underground” by The Velvet Underground and Nico. 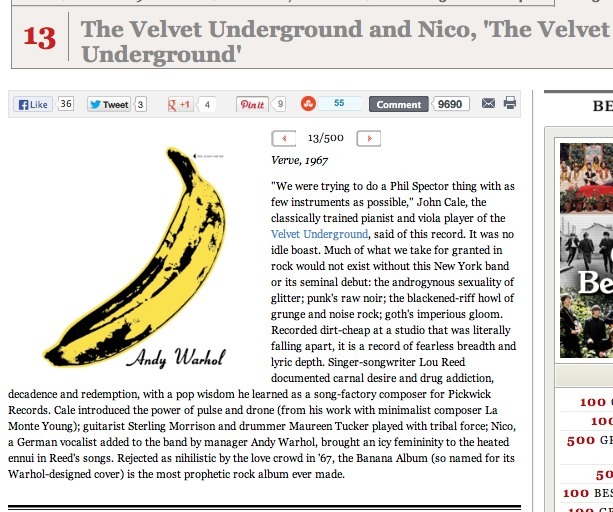 At number 13 in Rolling Stone Magazine’s list of the 500 greatest albums is “The Velvet Underground” by The Velvet Underground and Nico. I am not that familiar with this album, I do not own it but decided to listen to it through one of the online streaming services. I have one Velvet Underground album, “White Light, White Heat”, the second of their five studio albums. Although I had not heard this album before, I was familiar with two of the songs on it, “I’m Waiting for the Man” and “Heroin”. Both songs I like a lot. I am, however, a fan of Lou Reed, owning several of his solo albums including his most famous, “Transformer” and “Berlin”. It is clear from what Rolling Stone Magazine says about this album that they consider it to have been hugely influential on later music. As we are now deep in the top 20 of this list that will become an increasingly common feature of the albums – they are rated highly not because of their popularity in copies sold, but rather because of the influence they have had on the music of the time and the music that followed them. Here is the song “Heroin” from the album. Does anyone who is familiar with this album agree with the statement that this albums is “the most pro­phetic rock album ever made”? What is your favourite Velvet Underground song? I woke up a few weeks ago to hear the middle of an interview about this story, so I thought I would check it out. As any regular readers of this blog will know (all two of you), I do have something of a fascination with calendars. I’ve blogged about how Ramadan is determined, how the Chinese New Year is determined, how Easter is determined, how Rosh Hashanah is determined. If truth be told, I think I have a bit of an obsession with calendars! The only natural cycles we have are the daily cycle of day and night, the monthly cycle of the phases of the Moon, and the annual cycle of where the Sun is in the sky. So the idea of a week is completely arbitrary, as is having 24 hours in a day or 60 minutes in an hour. Most primitve calendars used the Lunar cycle. Apart from the daily cycle of night and day, the cylcle of the phase of the Moon is the most obvious thing we can observe. It is much more obvious that the annual cycle of the Sun. The time between full Moons on average is 29.53 days. The trouble is, if we base our calendar on this we do not get an exact number of months in a year. The Sun takes 365.25 days to come back to the same place in the sky at the same time, something primitive civilisations were able to determine, but it took a little time. 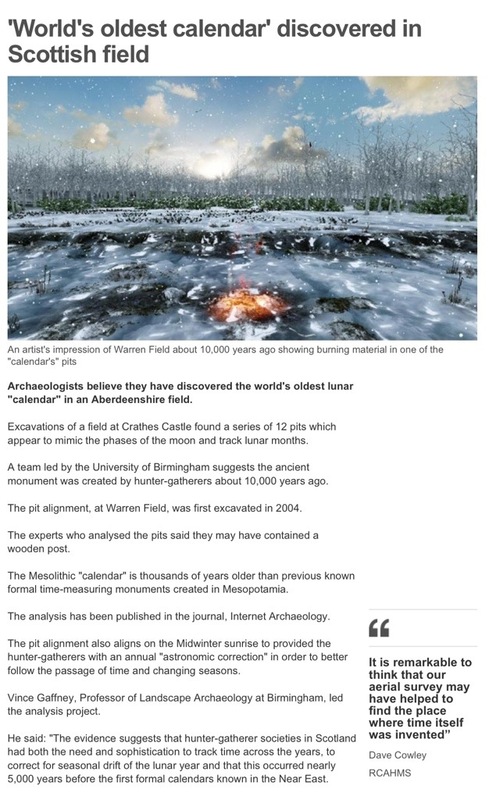 It was the Babylonians who first got the length of the year down to the accuracy of 362.25 days that we use for most purposes today (in fact it is not exactly 362.35, something I will talk about in a future blog). It is interesting to note that this old calendar, dating from 10,000 years ago (so pre-Babylonian) has a stone which lines up with the position of the Sun on the Winter Solstice. This would have allowed them to correct for the discrepancy between the Lunar month and the Solar year, keeping their calendar in agreement with what the Sun is doing. The only calendar that I know of which does not correct for what the Sun is doing is the Islamic calendar.